In his mid 60s, Bob Plantz was still giving lessons but thought he was probably done coaching baseball on a team when he got a call from a former player. It was Larry Keeker at McNary. He needed a pitching coach and wanted to know if Plantz was interested. The two met at Applebee’s. Plantz began coaching in 1967, leading the freshman team at Wilson High School in Tacoma, Wash., while student teaching at the University of Puget Sound. Plantz’s first teaching job was at Silverton, where he again coached freshmen. He then became the head junior varsity coach at Mt. Angel. After giving law school a try, Plantz got back into coaching at Whiteaker in 1974. One of his players was Keeker. They were also neighbors and Keeker served as Plantz’s classroom aid. Plantz left Whiteaker in 1978 to become the first head baseball coach at McKay High School. In 1983, Plantz’s team defeated Corvallis in the last game of the regular season to win the school’s first league championship in any sport. On that McKay team was Deputy Chief of Keizer police Jeff Kuhns and Dave Brundage, who went on to become an All-American at Oregon State and made it to AAA with the Seattle Mariners. He now manages the San Francisco Giants AAA team—Sacramento River Cats. After five years at McKay, Plantz went to Newberg, where he coached baseball and softball before retiring in 1998. He had a Grand Slam batting cage franchise in West Salem and then started doing lessons at the Courthouse. 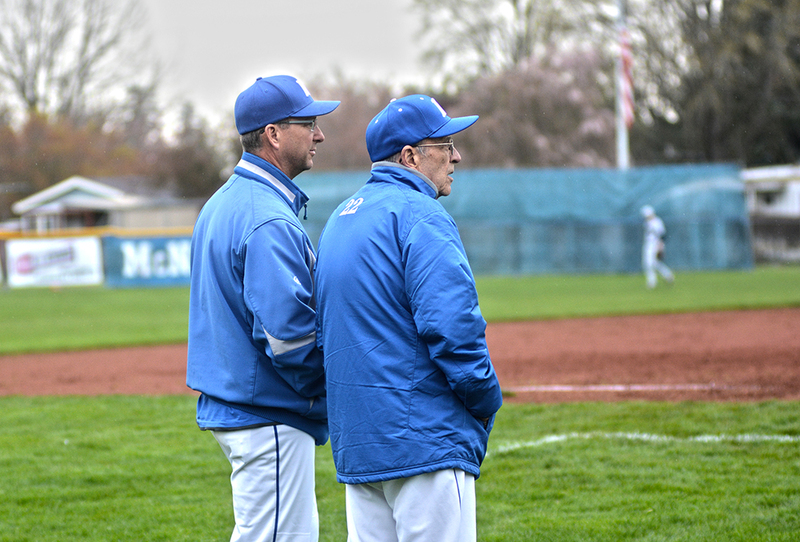 Retirement didn’t stick and Plantz assisted Jerry Walker when he started the baseball program at Blanchet Catholic School. But when Walker left, so did Plantz. But that retirement didn’t last either as Plantz joined Keeker at McNary five years ago. Plantz biggest point of emphasis is teaching good mechanics to avoid injuries. He and Keeker call games together. Two pitching performances stand out in Plantz’s time at McNary. In 2014, the Celtics opened league play with a 1-0 win over South Salem as McNary junior Mickey Walker out-pitched Sam Tweedt, the reigning Pitcher of the Year, who went on to sign with Oregon State. The second came in 2015. Down in Arizona, with West Salem watching after playing the game before, McNary senior Nick LaFountaine threw 45 pitches and couldn’t get out of the first inning. But LaFountaine came back to defeat West Salem 8-3 later in the season. Plantz had surgery for prostate cancer just before Christmas. His prognosis is optimistic but he doesn’t know how much longer he’ll keep coaching. Keeker is happy to have Plantz on his staff as long as he wants to be there. “He’s helped baseball players literally at all different levels so that experience alone is certainly valuable to our program,” Keeker said.